At The Irish Repertory Theatre tonight for Michael Evan Haney’s new production of Around the World in 80 Days, presented in association with Cincinnati Playhouse in the Park. 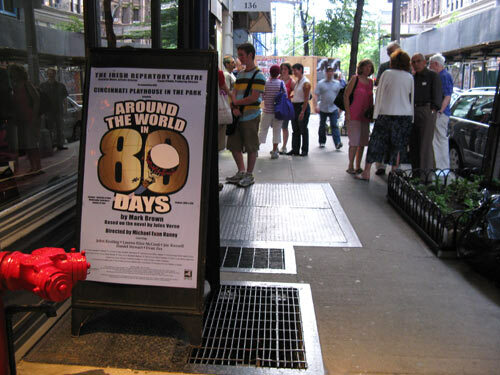 Previews began on July 11, 2008 for a limited engagement that was originally scheduled to end on September 7, but has since been extended through September 28. 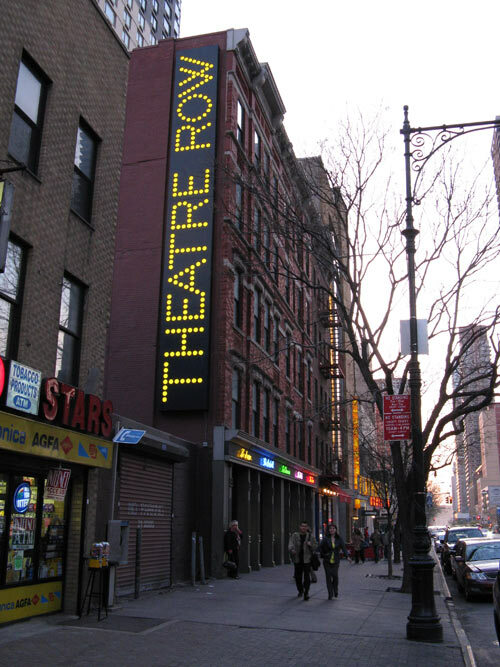 I was last at this theater on West 22nd Street for George Bernard Shaw’s The Devil’s Disciple in December, so knew that the company was well used to accomplishing much with minimal resources – cast and space-wise. Still, the story, based faithfully on the 1873 novel by Jules Verne, stretched the limits over the ensuing two hours of action: 5 actors, playing 39 characters, and one simple set, representing 24,000 miles of rugged land and high seas. Mark Brown adapted the adventure of unflappable English gentleman Phileas Fogg (Daniel Stewart), who makes a £20,000 wager that he can circumnavigate the globe in the titular 80 days. The journey, made with his French manservant Passepartout, takes Fogg from London to Suez to Bombay to Calcutta to Hong Kong to Yokohama to San Francisco to New York to Liverpool and back to London. Mistaken identities, skirmishes with local officials, weather delays, a lady in distress and sheer bad luck all seem to conspire against Fogg meeting his deadline, but we all know how things turn out in the end, don’t we? The 19th century source material veered at times into political incorrectness in its characterization — or rather: caricaturization — of foreign cultures, and that bias unfortunately also colors this production. Passepartout (Evan Zes)’s Pepé Le Pew accent, while good for a few early chuckles, wore thin after a while. Overall, though, this was a pleasant enough romp that received middling to good reviews in the press. Most fun to watch was how the indispensable pair of on-stage foley artists kept flawless pace with the action when called upon to suggest swaying steamers, chugging trains, a lumbering elephant, a raging typhoon, a sledge through a snowstorm and gunplay with Apaches. (Contrary to popular impression, however: no hot air balloon.) In an age of ever more elaborate special effects, their work was a refreshing return to basics. Incidentally, Fogg’s £19,000 in travel fees would have been the equivalent of nearly £1.5M today, adjusted for inflation. It now costs considerably less to make the same trip, even when accounting for fuel surcharges and airline baggage fees. At Theatre Row for the American premiere of Ayub Khan-Din’s Rafta, Rafta… directed by Scott Elliott — a last minute replacement for Kevin Elyot’s Mouth to Mouth, which The New Group will be presenting in the fall. This the second of Khan-Din’s plays to be produced here; the company staged East is East in 1999. First my life, then the life of my life, and then life of life itself. After their wedding feast — an overlong evening involving two sets of families, copious whisky drinking, spirited bhangra dancing, and a father-son arm-wrestling match — Atul Dutt and Vina Patel (Manish Dayal and Reshma Shetty in their fine Off-Broadway debuts) embark on their wedding night at Atul’s parents’ house. It soon becomes apparent, however, that their new home is not the ideal place to begin a new marriage: with the groom’s parents a thin bedroom wall away, their loving union remains unconsummated after six long weeks. When word leaks out after a frustrated Vina confides in her mother (Sarita Choudhury, whom we saw last fall as Frida Kahlo), some hilarious, but cringe-worthy interference ensues as both sets of concerned parents convene to decide how to best tackle the delicate situation. In addition to the impressive bi-level set by Derek McLane, the play features original music by Basement Bhangra™ founder DJ Rekha at rousing volumes. Rafta, Rafta… is playing a limited engagement at the Acorn Theatre through June 21, 2008. The “Pizza” episode of the History Channel’s “American Eats” series — set your TiVos for the next airing: Tuesday, April 29, 2008 — tells the story of Gennaro Lombardi, the “founding father of American pizza,” and his contribution to New York City pizza: locally grown tomatoes (instead of San Marzano), cow mozzarella (instead of water buffalo), and pies fired in coal ovens. 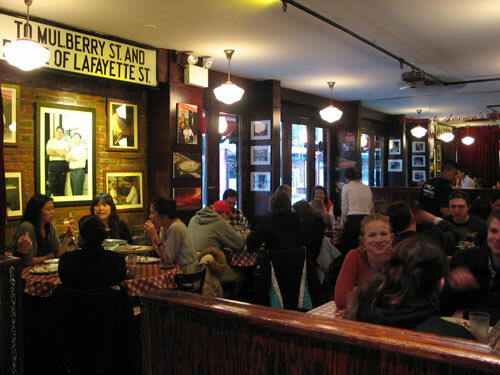 To some extent, all the old school city pizzerias can be traced to Lombardi’s pioneering shop at 53½ Spring Street. That first pizzeria was established in 1905, though in 1994, Lombardi’s grandson re-opened it at its current location at 32 Spring. 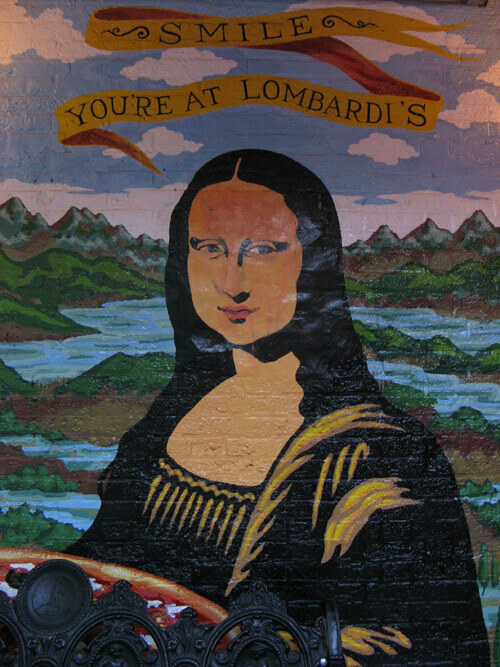 For the pizzeria’s centennial on November 10, 2005, Lombardi’s sold whole pizza pies for 5 cents apiece. We paid somewhat more for our pepperoni and mushroom pie, but it was still worth it. At the Clemente Soto Vélez Cultural & Educational Center‘s Milagro Theater on Suffolk for the premiere of playwright Carla Ching’s TBA. The 1898 building is a former public school (P.S. 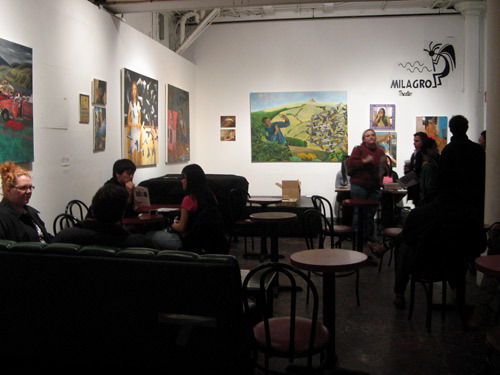 160), but since the mid-1990s, has served as a multicultural center for contemporary arts and art-related community services. 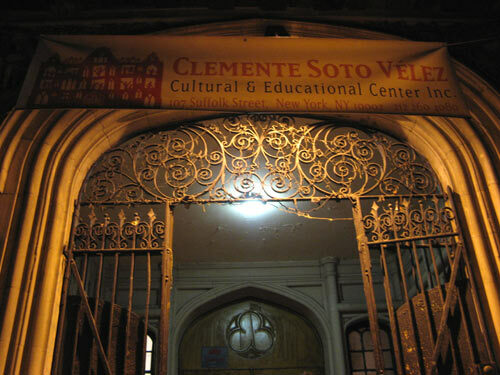 CSV has four theaters and exhibition spaces; 53 visual artists have studios in the building. Enhancing the LES hipster vibe was a dimly lit bar/gallery through a beaded doorway on the ground floor with vibrantly colored paintings of female nudes and cans of PBR, which we were invited to bring inside the theater. 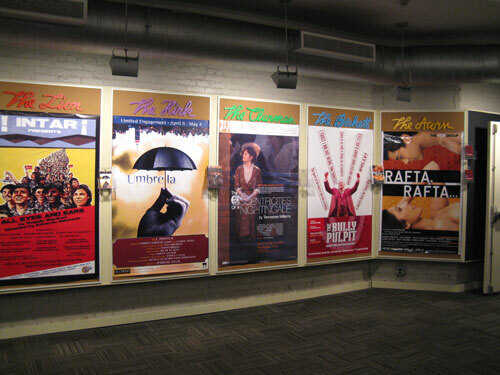 Through April 5, theater company Second Generation celebrated its eleventh anniversary of supporting Asian American dramatic literature with ELEVEN, a month-long festival of 11 plays: one full-length production, four developmental staged-readings, and an evening of six one-acts. The centerpiece was Ching’s drama, starring Lloyd Suh, Second Generation’s artistic director and a playwright in his own right. (Both he and Ching are members of the Ma-Yi Writers’ Lab.) Suh appeared as a last-minute replacement for Ken Leung, who was called back to the set of Lost, where he has a recurring role as Miles Straume. An intriguing exploration of how impression and memory can form their own reality. Excellent work all around. Oh, and we sat in front of Dr. Chen from ABC’s “Eli Stone,” whose real name is James Saito.